LITTLE ROCK, Ark. – Mitchell, Williams, Selig, Gates and Woodyard, P.L.L.C. 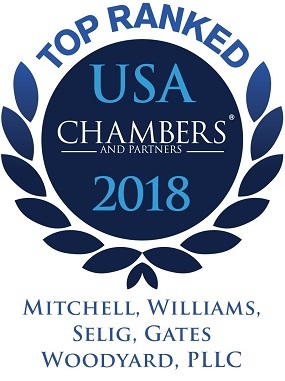 earned recognition in the 2018 edition of Chambers USA: America’s Leading Lawyers for Business and in Chambers High Net Worth. In all, 22 attorneys in five practice areas achieved rankings. The firm achieved top ranking in the practice area of Corporate / Commercial and rankings in the Labor and Employment, Litigation and Real Estate practice areas. Chambers High Net Worth ranked the firm in Private Wealth Law. Attorneys ranked in the corporate/commercial practice area, which includes municipal bonds and tax, are Michele S. Allgood, Travis Baxter, C. Douglas Buford Jr., D. Nicole Lovell, Walter May, Anne S. Parker and John S. Selig. Ranked in the labor and employment practice area listing are attorneys Byron Freeland and Kathlyn Graves. Attorneys ranked in the litigation practice area, including general commercial, environmental and medical malpractice defense, are John K. Baker, Sherry P. Bartley, RT Beard III, Michelle Browning, Ken Cook, Allan Gates, Lance R. Miller, Scott Provencher, Lyn P. Pruitt and Walter G. Wright Jr. Attorney Sherry P. Bartley achieved rankings in both environmental and commercial litigation. Ranked in the real estate practice area listing are attorneys W. Christopher Barrier and Harold W. Hamlin. Chambers High Net Worth ranked Jennifer Pierce in the practice area of private wealth law. Barrier, Parker and Selig were ranked as Senior Statesmen in their respective practice areas. Chambers USA is published by Chambers and Partners Publishing, a premier guide to the legal profession. Each year, Chambers conducts in-depth research and interviews with clients and attorneys throughout the United States. Inclusion in Chambers USA is based completely on the research and peer interviews conducted and cannot be initiated by a firm or attorney. Mitchell, Williams, Selig, Gates & Woodyard, P.L.L.C. is a 92-attorney corporate law firm that provides strategic and comprehensive legal services to help clients achieve their goals. Established in 1954, the firm has offices in Little Rock, Rogers and Jonesboro, Arkansas and Austin, Texas. Chambers USA is published annually by Chambers & Partners to assess and rank the leading attorneys and law firms in the United States, based on peer and client reviews. Chambers’ researchers conduct in-depth interviews of clients, colleagues and the lawyers themselves to develop the rankings for the law firms and attorneys. Chambers’ rankings are based solely on the research team’s findings and there is no cost for inclusion. To learn more about Chambers and Partners, visit www.chambersandpartners.com.